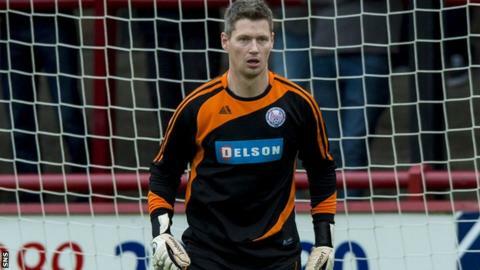 Brechin City goalkeeper Graeme Smith had to make an 83-mile dash north to make his side's Scottish League 1 game against Stenhousemuir after going to the wrong stadium. Smith arrived at Stenhousemuir's Ochilview ground in plenty of time for the 15:00 GMT kick-off only to discover the game was at Brechin's Glebe Park. Fortunately, Smith made it to the Angus club's home in time to take his place in the starting XI. However his side lost 2-1 and remain bottom of the division. Smith's error was spotted by William Hoggan, Stenhousemuir's head of community football, who tweeted: "Brechin City keeper Graeme Smith rocks up to Ochilview Park today but they're the home team. Haha classic."